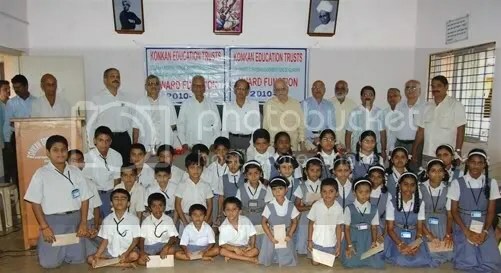 Here is the list of students awarded the 2010 Shanbhag Scholarships in Kumta, India. I thank the many donors who made valuable contributions, so needy students could gain a good education. As our program has matured, we have expanded to support 50 students (29 girls, 21 boys) at six schools in Kumta, with only 11 of 50 students at the Shanbhag High School. In the complete list below, the prefix Kumari, refers to girls. Scholarships were granted purely on the basis of need and included full tuition and a daily fabulous lunch. NB: The Saraswati Vidya Kendra and the Shanbhag High School are managed by the Konkan Education Trust. The Gibb High School, Gibb Girls High School, Mahatma Gandhi High Shool, and the Gibb English Medium High School are managed by the Kanara Education Society, Kumta. Since many of the Kanara Education Society schools receive government aid, as well as food for their students, their scholarships costs are much lower. Scholarship for the needy 2008-2009. Scholarship for the needy 2009-2010. Academic Update from the Shanbhag School – 2008. Academic Update from the Shanbhag School – 2009. Stellar students! It really was a great delight to trek your website, read the articles one after the other & keep on gazing at the pictures of my home town. You made me Nostalgic driving me down the memory lane and it was a Thrilling Experience memorizing my sweet childhood days, places where we studied & played, seeing the photos every now and then of My School, Gibb High School.. I do visit Kumta, my hometown, at least once in a year, for Ganesh Chaturthi at our Ancestal House in the Heart of the Town & in the summer holidays too. The wonderful work done by you is highly commendable & I thank u very much from the bottom of my heart for your sincere efforts & trouble taken in helping the school management as well as raising funds towards scholarships for the needy students as well as erecting the new school premises at Chitrigi. However, may I make an humble submission to you by appealing to stretch your helping hand a bit ahead so as to reach it towards Gibb High School, the Parent Organisation, which still remains as it was since last more than 6 Decades. Please keep on updating your wonderful work with sizzling photos & current developments. May I also request you for the link of the Video Widget “Approaching Kumta On Konkan Railway” which I would like to display on my facebook page, with your due permission, if you so wish, for the benefit of knowledge to my friends & relatives. Thank you once again! Thank you for your kindness. I am glad the post and pics are helping you reconnect back to Kumta. Just after the recent Ganapati, I was in Kumta as well. The work as the School is very fulfilling. Amazing students and the least that we can do is to support their work. BTW, even before you mentioned Gibb High School, we are already supporting about 25 students from the Kanara Education Society which includes Gibb High School, the Gibb Girls School and else. See some of the details here. And I hope to continue this work. I just sent you an email with the direct link to the video, but am not sure how it would appear on Facebook. Sometime over the weekend I will post this on You Tube and you should be able to post that on FB. Thank you very much for your gracious words & the wonderful philanthropic work you are carrying, keep it up! We all, hailing Kumta, are really proud of you. Actually, Just realized the video is already on You Tube. Post this link in your FB. Congrats..A great effort. Just reminds me individual efforts go a long way. Indeed your gesture inspires me to do more. Thank you Preena. It is very satisfying and enriching.